Paneer Samosas is one of the most popular Indian snacks to fill with a cooked veggies,spices and some other ingredients mixture with a spicy potato. This appetizer recipe is one of the interesting variations of Paneer Samosa which you will find on Indian restaurants and on street . This Indian snack recipe is made with frying paneer in a stove with a little spices. Samosa tastes best when serving hot with tomato or coriander sauce. You can prepare this Paneer samosa at home very easily. 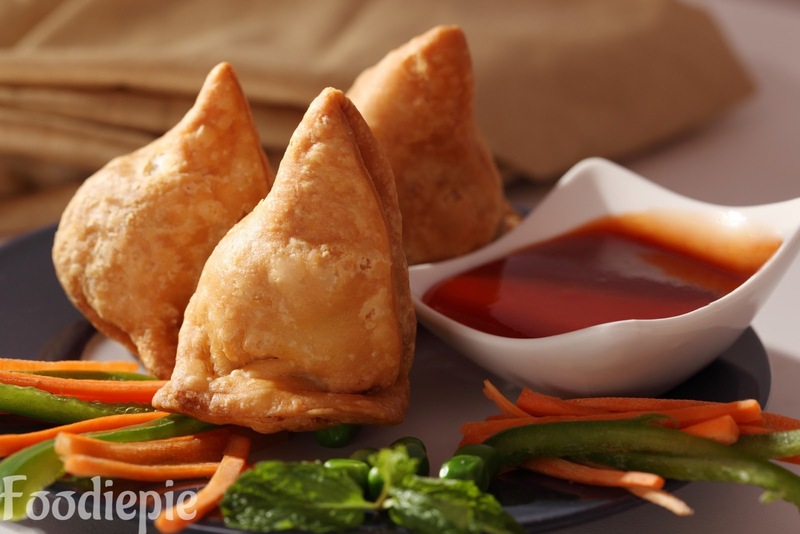 Enjoy this easy cheese Samosa recipe at home with your Indian flavors.Lets'checkout recipe of Paneer Samosa. Step 1 : Boil the potatoes until they will turns softer.Put ghee and salt in the Maida and mix well. Add lukewarm water and make little bit hard dough. Cover the dough for 20 minutes to be set. Step 2 : Now peel the potatoes and mash them with hand. Step 3 : Heat the pan add 1 spoon of oil, add ginger, green chilli and green peas,paneer in hot oil, mix all ingredients well and let it cook for 2 minutes, green peas and paneer will become slightly soft. Step 4 : When Peas and paneer turns softer then add mashed potatoes,garam masala,salt,lemon juice,Coriander powder and leaves in frying ingredients. Mix all well and now samosa filling mixture is ready. Step 5 : Now, to prepare samosa, uncover the dough knead once again and take part in it. Prepare a small ball of dough and roll them in small / medium puries or chapati/roti. Using a knife, cut them in half. Take a half of Puri and shape it in the cone using the edge of your palm. Fill this with 1 or 2 teaspoons of this cheese mixture. Fold and seal the edges with small water,Prepare all the samosas like that. Step 6 : Now its time fry the samosas add oil to the pan and heat it. Put 5/6 samosas in oil and fry them until turns golden brown on medium flame. Finally : Spicy paneer samosa is ready.Serve hot samosas with red chutney and ketchup.